The next of the 2012 Conversations about Anarchism will take place Nov 7th in the WSM space in Seomra Spraoi. The topic is Anarchism & Feminism. Once it became clear that the Children's referendum was going to be passed Twitter came alive with outraged Yes campaigners complaining about the low turnout. It demonstrated that no one, it appears, was willing to 'think of the children.' Pop singer Sinead O'Connor went so far as to suggest that it should be made a criminal offence not to vote. 100's of women have medical abortions in republic but what of those who can't? Anti-choice bigots are going into a frenzy to try and prevent the Irish government legislating for abortion provision in the republic as required by the X and C judgements. But they are ignoring the reality that 1000 plus women are already obtaining abortions in the republic every year and are simply making that decision for themselves. The bigots 'keep Ireland abortion free' crusade was fake even before the opening of Marie Stopes in Belfast, the false slogan is presumably designed to fool the US donors whose donations the bigots salaries and offices depend on. But it is having tragic consequences for women in Ireland as those unable to access abortion pills are left without access to abortion. An 8 minute video from the demonstration last night at the Dail which 3000 people attended. March on Saturday at 4pm from Parnell Square, bring a candle to light at the Dail at 5, the same time candles are being lit in Galway and elsewhere. 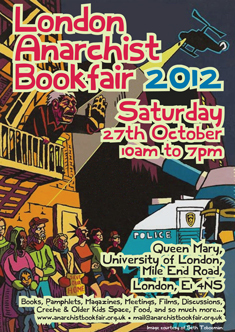 The London Anarchist bookfair is the biggest event on the UK anarchist calendar and this year was the first time I was able to go. Getting to the Mary's University venue in East London was a bit of an adventure and made more difficult with the underground being partially closed. Although I missed the lifestyle anarchism lecture earlier in the day, I did get to the other main talk that piqued my interest – the two hour Anarchist Economics lecture in the Mason Lecture Theatre with the speakers posted as “David Graeber, Michael Albert and others”. March to protest the horrific state of affairs as it stands in Ireland, where Savita Halappanavar in the year 2012 in an Irish hospital died suffering and in pain after being denied an abortion she and her husband repeatedly requested. Enough is enough. No more women can die. From the Garden of Remembrance at 4pm to the Dáil, where we will hold a candlelight vigil in conjunction with Galway Pro-Choice to grieve Savita's unnecessary death. Bring a candle to light to mark her loss. Abortion Legislation - "We owe it to Savita and the bravery of her husband in making this story public"
One of our members who has been active in pro-choice struggles since the 1980's and who was one of the organisers of the X-case march gave this interview to Ideas & Action. "I think the expert group is a joke. I know that an abortion law was drawn up over 15 years ago. A law was proposed in the Dail in April and rejected by all the leading parties. It is absurd to say that the politicians need more expert advice. In fact all the various political parties have done in the last twenty years has been to commission a report. .. the group has little to do with expertise and a lot to do with political avoidance and cowardice." This college year has seen a large increase in the number of students taking out loans in order to go to college. As part of an aggressive advance into the student debt market, Bank of Ireland has already agreed schemes to provide “discounted loans” to students in DCU and Trinity, and to postgraduate students across the country (in this case the scheme was negotiated directly with theState) .BofI is also said to be in “advanced discussions” with over 10 other 3rd-level institutions. On the weekend of 5th-7th October, Anti-Fascist Action Ireland held a series of events to celebrate their twenty one years in existence. The organisation was founded in 1991 with the aim of fighting fascism both physically and ideologically as and where the need arises. Our members in Cork and Dublin have been active in the Campaign Against Household and Water Taxes, at local, regional and national levels, helping with stalls, leafletting and demos, and arguing for greater grassroots democracy within the campaign. Never Again - Abortion Rights Now! Today we are marching in protest at the tragic death of Savita Halappanavar, a pregnant woman who died after being refused a termination, despite requesting one several times. For years many people have been aware that the failure of successive governments to legislate could result in a tragedy. Whether through cowardice or callousness, since the X case ruling and three referendums allowed for abortion under restricted circumstances 20 years ago, no laws have been drafted to allow doctors to carry out those abortions. Savita’s death should not have happened. Just as her husband Praveen has pledged to fight for a change in the law to ensure that no other woman dies in the way that Savita did, so every one of us here should pledge to fight for that law change. Nine men appeared in Cork's District court charged with offenses alleged to have occurred at a whiteline picket in the city on June 30th. The charges essentially argue that the men were obstructing traffic. Whiteline pickets are a common feature of protests across the country and are most often used in relation to prisoner issues. A whiteline picket is where a number of protestors stand on a continuous whiteline in the middle of a street holding placards highlighting the particular issue. Saturday 17th Nov 2012 saw a Ireland-Palestine Solidarity Campaign (IPSC) protest in the center of Dublin against the attacks on Gaza by the Israeli state. Speakers at the protest on O'Connell street included a Gaza resident and a member of the Israeli Anarchists Against the Wall group - both speeches are in the embedded video. On Saturday 24th November, thousands of people will march from Parnell Square to the GPO in Dublin behind the slogan “Boycott The Property Tax. Fight Austerity”. This protest, jointly organised by the Dublin Council of Trade Unions, the Campaign Against Household and Water Taxes, Communities Against Cuts and the Spectacle of Defiance and Hope, will give people the opportunity to show their opposition to the introduction of the property tax and the further entrenchment of the austerity agenda which will come in the budget on 5th December.